I like the tusk helmet, but prefer the look of the shoulder spikes to those on his back; I do understand that there is a certain difficulty to making fine details visible at this scale though. Might I suggest a middle of the road option: A split sprue, with five back spike heavies on one side, and five non-back spike ones on the other, like the horns/top knot split on the Tainted Elites. That way, there is some variation, and the first five can be easily made spike-less if desired. Thanks for the feedback guys we shall take another pass at this one, note that both the spikes and the horns can be easily snipped off if you don't like either or. I was more concerned about if this was going to be the style for the entire elite Tainted faction, but if it is only with this ones i have not much of a problem in taking off the horns/spears/spikes and it will also please those that like them. I hope the rest of the range have them easy to take off too and not in the middle of some detail or frail part. Relative scales next to each other. The Decimator is approx, 50mm in diameter and the Rampager 18mm in diameter. Reminds me a bit of General Grievous's monowheel, and also of how terrifying these huge, outlandish warmachines would be on the battlefield. Indeed sir totally nuts but totally cool non the less. Operating on the fringes of Novan space these renegade Elites of a fallen great house have turned to piracy and raiding to survive. Alongside the remaining regular human forces from the same house and various allies of unknown origin these so called Tainted are becoming an existential threat to the Novan Hegemony. 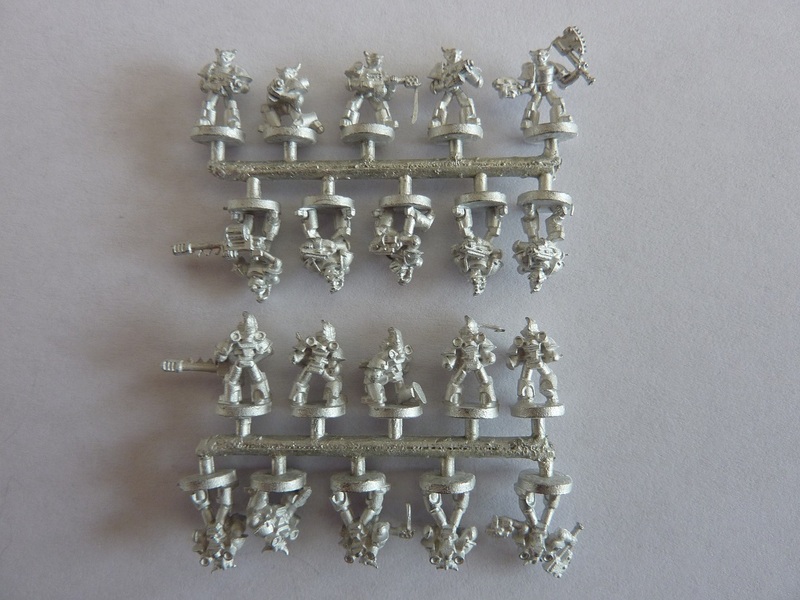 Set contains 40 x Tainted Elites Affray miniatures. Tainted armies maintain a warped semblance of the Leadership structure of their loyal Novan origins. With the latest releases in particular, this really is building into an excellent range. I just hope these items fly off the shelves ! This evening we release the last of the funding campaign's Tainted models. We have Tainted Affray in heavy armour, Tainted heavy armour command and Tainted Hierarch's. They look fantastic John, Especially the heavy armour ! First of hopefully a growing range of Tainted regulars vehicles, the Centurion (hector) released this evening in a six vehicle set with two hull variants.